Grant has served as CFO since August 2012. Previous to WAXIE, Grant was the CFO for a locally based software company that specialized in optimization of medical records through digitization, indexing and abstraction. Grant has also held positions of Controller and Director of Finance for both private and public companies where he was responsible for the financial planning, analysis, reporting and risk management of the organizations. Grant has experience in a number of industries including manufacturing, distribution, software and energy. 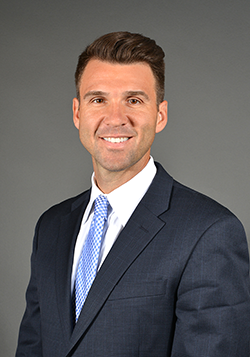 He has spent the majority of his career in San Diego working for both Sempra Energy and Gateway, Inc. Before moving to San Diego, Grant worked in public accounting for KPMG in San Francisco as well as Sydney, Australia. In addition to Grant's general finance and management experience, he has been instrumental in merger, acquisition and outsourcing transactions. Grant is only the 5th person in our 74 year history to hold the position of CFO. At WAXIE he is responsible for directing and implementing systems, policies and procedures related to WAXIE’s fiscal operations. He oversees all financial planning, reporting and analysis as well as Accounting, Tax and IT functions. He also contributes to the overall organizational and strategic planning initiatives of WAXIE as a member of the executive team. Grant earned his B.A. in Accounting, Finance and International Studies from Indiana University, Bloomington. In 2017, Grant was recognized as one of San Diego’s 40 Under 40 representing some of the best in brightest minds in the County. He has his private pilot license and enjoys activities such as scuba diving, golf and running. Grant enjoys participating in WAXIE’s corporate Making Strides Against Cancer campaign as well as being a Big Brother for the SDBigs program, supporting Monarch School and San Diego Blood Bank.